Robert King Merton (July 4, 1910 – February 23, 2003) was a distinguished American sociologist, who spent most of his career teaching at Columbia University. He coined several phrases that entered into common parlance, including "self-fulfilling prophecy" and "unintended consequences." His work included development of the concept of anomie, derived from Emile Durkheim. Merton, however, focused on the discontinuity between cultural goals and the legitimate means available for reaching them. Applied to the United States, he saw the American dream as an emphasis on the goal of monetary success but without the corresponding emphasis on the legitimate avenues to achieve this goal. Merton recognized that this imbalance leads to "strain," which in turn may generate deviant, even criminal behavior. His theories have been applied in the area of criminology, to understand causes of criminal behavior, and in the development of government programs, such as affirmative action, that seek to redress the balance between society's goals and the means by which all members of the society can achieve them. Through his research into the dysfunctions in society, Merton's goal was to contribute to the betterment of human society and improvement in the lives of all its members. Robert K. Merton was born Meyer R. Schkolnick on July 4, 1910, in Philadelphia, into a working class Eastern European Jewish immigrant family. Educated in the South Philadelphia High School, he became a frequent visitor of the nearby Andrew Carnegie Library, The Academy of Music, Central Library, Museum of Arts, and other cultural and educational centers. He changed his name at the age of 14 from Meyer R. Schkolnick to Robert Merlin, after the Merlin of Arthurian legend. However, friends convinced him that the name was too "magical," and he changed it to Merton. Merton started his sociological career under the guidance of George E. Simpson at Temple College (1927-1931), and Pitrim Sorokin at Harvard University (1931-1936). It is a popular misconception that Robert K. Merton was one of Talcott Parsons’ students. Parsons was only a junior member of his dissertation committee, the others being Pitirim Sorokin, Carle C. Zimmerman, and the historian of science, George Sarton. His dissertation, a quantitative social history of the development of science in seventeenth-century England, reflected this interdisciplinary committee (Merton 1985). Merton was heavily influenced by Pitirim Sorokin, who tried to balance large-scale theorizing with a strong interest in empirical research and statistical studies. Sorokin and Paul Lazarsfeld persuaded Merton to occupy himself with "middle-range" sociological theories. Merton taught at Harvard until 1939, when he became professor and chairman of the department of sociology at Tulane University. In 1941, he joined the Columbia University faculty, becoming Giddings Professor of Sociology in 1963. He was named to the university's highest academic rank, university professor, in 1974 and became special service professor upon his retirement in 1979, a title reserved by the trustees for emeritus faculty who "'render special services to the University." He was associate director of the university's Bureau of Applied Social Research from 1942 to 1971. He was an adjunct faculty member at Rockefeller University and was also the first Foundation Scholar at the Russell Sage Foundation. He retired from teaching in 1984. In recognition of his lasting contributions to scholarship and the university, Columbia established the Robert K. Merton Professorship in the Social Sciences in 1990. Merton was married twice, including to fellow sociologist Harriet Zuckerman. He had two sons and two daughters from the first marriage, including Robert C. Merton, winner of the 1997 Nobel Prize in economics. Merton had a long and prolific academic career, recognized both for his excellence in teaching and in his theoretical work in sociology. His approach took the form of middle range theory, through which he believed we could understand specific social phenomena. Notable contributions include his work on the concept of anomie in relation to social structure, his development of Weber's conception of bureaucracy, and his pioneering work introducing the field of sociology of science. Our major task today is to develop special theories applicable to limited conceptual ranges — theories, for example, of deviant behavior, the unanticipated consequences of purposive action, social perception, reference groups, social control, the interdependence of social institutions — rather than to seek the total conceptual structure that is adequate to derive these and other theories of the middle range. Sociological theory, if it is to advance significantly, must proceed on these interconnected planes: 1. by developing special theories from which to derive hypotheses that can be empirically investigated and 2. by evolving a progressively more general conceptual scheme that is adequate to consolidate groups of special theories. Examples of middle range theories include theories of social mobility and Emile Durkheim's theory of suicide. Merton adopted Emile Durkheim's concept of anomie, developing it, through several revisions, resulting in his strain theory of deviant behavior. Robert Merton set out to expand upon the concept of Durkheim’s anomie. He began by stating that there are two elements of social and cultural structure. The first structure is culturally assigned goals and aspirations. These are the things that all individuals should want and expect out of life, including success, money, and material things. The second aspect of the social structure defines the acceptable mode for achieving the goals and aspirations set by society. This is the appropriate way that people achieve what they want and expect out of life. Examples include obeying laws and societal norms, seeking an education, and hard work. In order for society to maintain a normative function, there must be a balance between aspirations and the means by which to fulfill such aspirations. According to Merton, balance is maintained as long as the individual feels that he is achieving the culturally desired goal by conforming to the "institutionally accepted mode of doing so." In other words, there must be an intrinsic payoff, an internal satisfaction that one is playing by the rules, and there must also be an extrinsic payoff, achieving the goals. It is also important that the culturally desired goals be achievable by legitimate means for all social classes. If goals are not achievable through an accepted mode, then people may come to use illegal means to achieve the same goal. Merton became intrigued by the possible outcomes, or dysfunctions, that occur when the balance between aspirations and means to achieve them is lost. He described several possible "adaptations" to the "strain" such imbalance produces: Conformity, Innovation, Ritualism, Retreatism, and Rebellion. This formed the basis of his famous strain theory. In his revised edition of this work in 1949, Merton changed the definition of cultural aspirations to include those goals held out as legitimate objectives for all or for diversely located members of society. The second large expansion of Merton’s original work can be noticed in the typology of individual adaptations in situations of anomie. Under the "Conformity" adaptation, he added a further explanation of society and its functions in his model. He stated that unless there is a deposit of shared values by individuals, there exists nothing but social relations, no society. He alluded to the fact that this may be the case within contemporary society. In describing the adaptation of "Innovation," Merton further developed the proposition that an individual who has not properly internalized the appropriate means for arriving at the sought after goal may choose some different avenue of relief. He also drew upon the discipline of psychology in asserting that a person who has a great deal of emotional investment in the culturally accepted goal may be unusually willing to take risk in the hopes achieving the desired end. It was Durkheim’s theory of anomie that inspired Merton’s theory of the same name. However, there is a fundamental difference between the theories and the direction in which they work. Merton, for the most part, accepted Durkheim’s concept of anomie and its meaning of a normless state of society. However, he then took the concept in another direction. Merton saw a disjunction between culturally devised goals and accepted means of achieving the desired ends, which leads to "strain." Durkheim, on the other hand, theorized that if the human appetite for goals was not regulated and became limitless, anomie would ensue, and from anomie, "strain" would emerge. Such strain would manifest itself in a variety of forms, one of which could be deviant behavior. Nevertheless, although Merton’s anomie theory is structurally different from that of Durkheim, it can be credited with drawing attention to the theory in America. Merton argued that the real problem is not created by a sudden social change, as Durkheim proposed, but rather by a social structure that holds out the same goals to all its members without giving them equal means to achieve them. It is this lack of integration between what the culture calls for and what the structure permits that causes deviant behavior. Deviance, then, is a symptom of the social structure. Merton's sociology of deviance theory does not focus upon crime as such, but rather upon various acts of deviance, which may be understood as leading to criminal behavior. Merton noted that there are certain goals which are strongly emphasized by society. Society emphasizes certain means to reach those goals (such as education, hard work, and so forth). However, not everyone has equal access to the legitimate means to attain those goals. The stage then is set for anomie. Merton presented five modes of adapting to strain caused by the restricted access to socially approved goals and means. He did not mean that everyone who was denied access to society's goals became deviant. Rather the response, or modes of adaptation, depends on the individual's attitudes toward cultural goals and the institutional means available to attain them. Conformity is the most common mode of adaptation. Individuals accept both the goals as well as the prescribed means for achieving those goals. Conformists will accept, though not always achieve, the goals of society and the means approved for achieving them. Innovation: individuals who adapt through innovation accept societal goals but have few legitimate means to achieve those goals, thus they innovate (design) their own means to get ahead. The means they adopt to get ahead may be through robbery, embezzlement, or other such criminal acts. Ritualism: in ritualism, the third adaptation, individuals abandon the goals they once believed to be within their reach and dedicate themselves to their current lifestyle. They play by the rules and have a safe daily routine. Retreatism is the adaptation of those who give up not only the goals but also the means. They often retreat into the world of alcoholism and drug addiction. They escape into a non-productive, non-striving lifestyle. Rebellion: the final adaptation, rebellion, occurs when the cultural goals and the legitimate means are rejected. Individuals create their own goals and their own means, by protest or revolutionary activity. 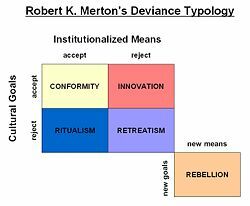 Innovation and ritualism are the pure cases of anomie as Merton defined it, because in both cases there is a discontinuity between goals and means. Such inadequacies in orientation which involve trained incapacity clearly derive from structural sources... (1) An effective bureaucracy demands reliability of response and strict devotion to regulations. (2) Such devotion to the rules leads to their transformation into absolutes; they are no longer conceived as relative to a set of purposes. (3) This interferes with ready adaptation under special conditions not clearly envisaged by those who drew up the general rules. (4) Thus, the very elements which conduce toward efficiency in general produce inefficiency in specific instances. Full realization of the inadequacy is seldom attained by members of the group who have not divorced themselves from the meanings which the rules have for them. These rules in time become symbolic in cast, rather than strictly utilitarian. Merton called this phenomenon "goal displacement." He observed that this occurred when formalistic goals become more important than the main substantive goal of an organization. Thus, Merton concluded that while the development of bureaucratic functions can be an effective division of labor supporting the efficient operation of social organizations, as Weber observed, it is equally likely to cause dysfunctions, harming the institution. Merton carried out extensive research, creating a new field of sociology of science. He developed the Merton Thesis to explain some of the causes of the scientific revolution, and the Mertonian norms of science to guide scientists in their quest for knowledge. The Merton Thesis is an argument about the nature of early experimental science. Similarly to Max Weber's claim that there was a link between the Protestant ethic and the rise of capitalism, Merton argued for a positive statistical correlation between the rise of Protestant pietism and early experimental science (Sztompka 2003). The theme of Puritanism-and-science seemed to exemplify the “idealistic” interpretation of history in which values and ideologies expressing those values are assigned a significant role in historical development. The [correlative] theme [in this study] of the economic-military-scientific interplay seemed to exemplify the “materialistic” interpretation of history in which the economic substructure determines the superstructure of which science is a part. And, as everyone knows, “idealistic” and “materialistic” interpretations are forever alien to one another, condemned to ceaseless contradiction and intellectual warfare. Still, what everyone should know from the history of thought is that what everyone knows often turns out not to be so at all. The model of interpretation advanced in this study does provide for the mutual support and independent contribution to the legitimatizing of science of both the value orientation supplied by Puritanism [and Pietism] and the pervasive belief in, perhaps more than the occasional fact of, scientific solutions to pressing economic, military and technological problems. (italics added). His thesis has been criticized for insufficient consideration of the roles of mathematics and mechanical philosophy in the scientific revolution, and for the arbitrary distinctions and statistical inaccuracies supporting his purported connection between Protestantism and the rise of science. Replying to some of the critics of the Weber-Merton Thesis, Merton suggested that the Puritan ethos was not indispensable, although it did provide major support at that time and place. He also noted that once having obtained institutional legitimacy, science largely severed its ties with religion, finally to become a counterforce, curbing the influence of religion. Still, religion was seen as crucially important to the genesis of the scientific revolution. Thus, Merton's 1938 doctoral dissertation, Science, Technology and Society in 17th-Century England, on the connections between religion and the rise of modern science, launched the historical sociology of science and has continued to elicit new scholarship. Organized Skepticism - all ideas must be tested and are subject to community scrutiny. Merton introduced many relevant concepts to the field, among them self-fulfilling prophecy and unintended consequences. Merton also coined the term "obliteration by incorporation" when a concept becomes so popularized that its inventor is forgotten. In this process of "obliteration by incorporation," both the original idea and the literal formulations of it are forgotten due to prolonged and widespread use, and enter into everyday language (or at least the everyday language of a given academic discipline), no longer being linked to their originator. Thus they become similar to common knowledge. Merton also introduced the term "multiples" to describe independent similar discoveries in science. These are instances in which similar discoveries are made by scientists working independently of each other. Robert K. Merton coined the expression "self-fulfilling prophecy"
The self-fulfilling prophecy is, in the beginning, a "false" definition of the situation evoking a new behavior which makes the original false conception come "true." In other words, a false prophetic statement may affect humans (through fear or logical confusion) to take actions that will ultimately result in fulfillment of the prophecy. The Law of Unintended Consequences states that almost all human actions have at least one unintended consequence. In other words, each cause has more than one effect, including unforeseen effects. The idea dates to the Scottish Enlightenment, which influenced people such as Thomas Jefferson. Merton popularized the concept, speaking of the "unanticipated consequences" of "purposive social action," emphasizing that his term "purposive action [is exclusively] concerned with "conduct" as distinct from "behavior." That is, with action which involves motives and consequently a choice between various alternatives." Ignorance: It is impossible to anticipate everything. Error: Incomplete analysis of the problem, or following habits that worked in the past but may not apply to the current situation. Immediate interest: It may override long-term interests. Basic values: They may require or prohibit certain actions, even if the long-term result might be unfavorable. These long-term consequences may eventually cause changes in basic values. Self-defeating prophecy: Fear of some consequence drives people to find solutions before the problem occurs, thus the non-occurrence of the problem is unanticipated. Merton received many national and international honors for his research. He was one of the first sociologists elected to the National Academy of Sciences and the first American sociologist to be elected a foreign member of the Royal Swedish Academy of Sciences and a Corresponding Fellow of the British Academy. He was also a member of the American Philosophical Society, the American Academy of Arts and Sciences (which awarded him its Parsons Prize), the National Academy of Education, and Academica Europaea. In 1994 Merton was awarded the U.S. National Medal of Science for his work. He was the first sociologist to receive the prize. He received a Guggenheim Fellowship in 1962 and was the first sociologist to be named a MacArthur Fellow (1983-1988). More than 20 universities awarded him honorary degrees, including Harvard, Yale, Columbia and Chicago, and, abroad, the universities of Leyden, Wales, Oslo, Oxford, and Kraków, and the Hebrew University of Jerusalem. Merton's work from the anomie perspective has led to an active research field as well as applications in criminology. Some of Merton’s ideas resulted in several programs in the United States during the 1960s. Programs dealing with strategies such as affirmative action and equal opportunity along race and gender lines are in keeping with the ideas of the anomie perspective. A particular program that emerged during the Kennedy administration called “Mobilization for Youth” has been specifically credited to Merton. There is no doubt that Merton, whose career spanned almost seven decades, has left an indelible mark on the academic world. Merton, Robert K. “Social Structure and Anomie.” American Sociological Review 3 (1938): 672-682. Merton, Robert K. “Social Structure and Anomie: Revisions and Extensions,” in The Family, edited by Ruth Anshen. New York: Harper Brothers, 1949. Merton, Robert K. Social Theory and Social Structure. Glencoe, IL: Free Press, 1957. Merton, Robert K. “Social Conformity, Deviation, and Opportunity-Structures: A Comment on the Contributions of Dubin and Cloward.” American Sociological Review 24 (1959): 177-189. Merton, Robert K. The Sociology of Science, 1973. Merton, Robert K. Sociological Ambivalence, 1976. Merton, Robert K. “On the Shoulders of Giants” in Shandean Postscript, 1985. Merton, Robert K. and Elinor Barber. The Travels and Adventures of Serendipity: A Study in Sociological Semantics and the Sociology of Science, 2004. Merton, Robert K. “The Unanticipated Consequences of Purposive Social Action.” American Sociological Review 1:6 (Dec. 1936): 894-904. ↑ Jeanne Curran and Susan R. Takata, Robert K. Merton, 2003. Retrieved May 29, 2007. ↑ Lars Mjøset, Understanding of Theory in the Social Sciences. ARENA Working Papers WP 99/33. Retrieved May 29, 2007. ↑ 3.0 3.1 3.2 3.3 3.4 Robert K. Merton, Social Theory and Social Structure (Glencoe, IL: Free Press, 1968, ISBN 0029211301). ↑ 4.0 4.1 4.2 4.3 4.4 Robert K. Merton, “Social Structure and Anomie.” American Sociological Review 3 (1938): 672-682. ↑ 5.0 5.1 Robert K. Merton, “Social Structure and Anomie: Revisions and Extensions,” in The Family, edited by Ruth Anshen (New York: Harper Brothers, 1949). ↑ Russel Heddendorf, “Religion, Science, and the Problem of Modernity.” JASA 38 ( 1986): 226-231. ↑ 7.0 7.1 Piotr Sztompka, “Robert K. Merton,” in Blackwell Companion to Major Contemporary Social Theorists, George Ritzer (ed. ), (Blackwell Publishing, 2003, ISBN 140510595X). ↑ Robert K. Merton, Piotr Sztompka (ed.) On Social Structure and Science (Chicago, IL: University of Chicago Press, 1996, ISBN 0226520714). ↑ Robert K. Merton, “The Unanticipated Consequences of Purposive Social Action.” American Sociological Review 1:6 (Dec. 1936): 894-904). Becker, George. “The Merton thesis: Oetinger and German Pietism, a significant negative case.” Sociological Forum 7(4) (1992). Retrieved June 23, 2015. Calhoun, C. “Robert K. Merton Remembered.” Footnotes (March 2003). Retrieved June 23, 2015. Heddendorf, Russel. “Religion, Science, and the Problem of Modernity.” JASA 38 ( 1986): 226-231. Retrieved June 23, 2015. Porter, Roy & Mikulas Teich. The Scientific Revolution in National Context. Cambridge University Press, 1992. ISBN 0521396999. Sarton, G. “Episodic Reflections by an Unruly Apprentice.” Isis 76 (1985): 470-486. Shapin, Steven. “Understanding the Merton Thesis.” Isis 79(4) (1988): 594-605. Snow, Eric V. “Christianity: A Cause of Modern Science?” Impact 298. Vulcan, A. P., M. H. Cameron and L. Heiman. "Evaluation of mandatory bicycle helmet use in Victoria, Australia." 36th Annual Conference Proceedings, Association for the Advancement of Automotive Medicine. 1992. Vulcan, A. P., M. H. Cameron and W. L. Watson. "Mandatory Bicycle Helmet Use: Experience in Victoria, Australia." World Journal of Surgery 16(3) (1992): 389-397. History of "Robert K. Merton"
This page was last modified on 27 June 2015, at 23:32.